BNC connections for Video In and optional Video out which enables, for example on-vessel viewing of the camera’s video locally. The GOST Watch HD system can be configured for a variety of video motion recording options. These options are configured by the Dealer according to requests. The GOST Watch HD can be set to record video clips 24/7 of every motion event that happens onboard your boat, record video motion events only when the GOST Phantom or GOST Phantom Insight HD is armed, or when there is an alarm event from the GOST Phantom or GOST Phantom Insight HD. ETHERNET (left) Connection to CAT5 cable from broadband modem or network to RJ-45 terminal. Adaptive technology networking for easiest, most reliable installation: Just plug the CAT5 cable into the network switch on board and the camera will automatically adapt to the network regardless of service and modem type. The video camera will auto configure through the network to the GOST Watch HD server & website. Fast 30FPS video viewing* on the GOST Watch HD website, accessible on virtually any computer, Smart Phone or other web-enabled device in the world. Seamless integration into GOST Phantom or other 3rd party systems with an input trigger to prompt the transmission of video clips to the GOST Watch HD server & website. Users can send clips out as email and/or text message to their contacts when it’s activated. 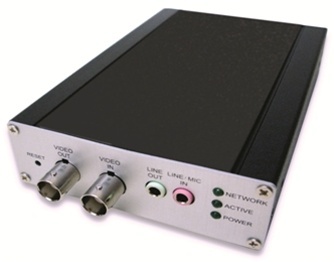 Video output for optional local viewing on vessels chart plotter, TV or other monitor on board, or for local distribution on all of the above, using a video modulator. Dynamic IP support through the GOST Watch HD server & website. Scalable video storage space on GOST Watch HD server & website, (50MB per device i.e. camera or IVR) for motion detection or alarm activation events in clients password protected account.